Instead of just getting a van, go with the van that has it all, the Honda Odyssey. Families choose this minivan over the competition for plenty of excellent reasons, like the spacious and comfortable interior, practical features, unrivaled safety, and amazing performance. Once you try it out, you’ll be convinced this is the van to get. Finding a 2019 Honda Odyssey for sale in Sacramento is easy. Come to Mel Rapton Honda, where we have plenty of selection, so you get the right new Honda. Since you spend so much time behind the wheel, it’s great to drive something that’s not only family-friendly, but also drives great. No matter what trim level you get, all Honda Odyssey minivans feature a strong 3.5-liter V-6 engine. It provides 280 horsepower and 262 lb.-ft. of torque, so even when the minivan is loaded down with people and gear, it can still get up to speed quickly. Plenty of power is great, but not wasting gas is also important. Honda includes direct fuel injection, variable cylinder management, and an Eco Assist system to squeeze the most out of every drop of gas. That means you pollute less, stop less often for fuel, and save money. 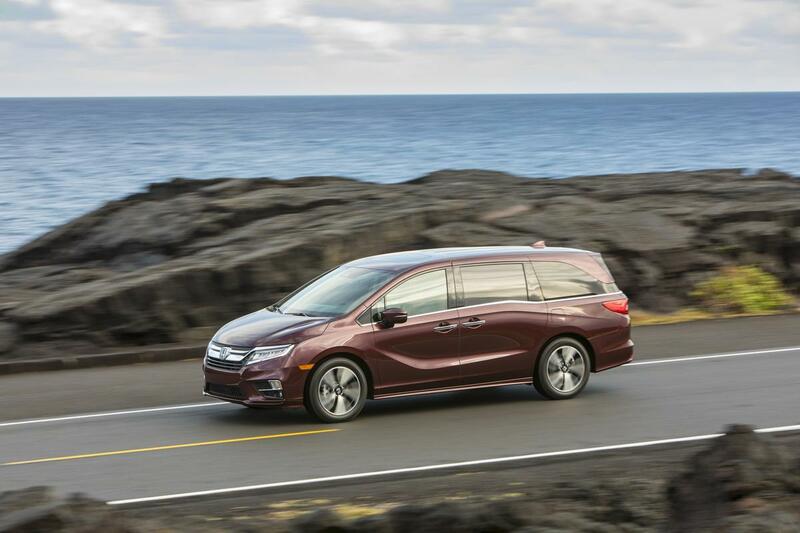 All Honda Odyssey models feature front-wheel drive. A 9-speed automatic transmission comes standard on all but the Touring and Elite models, which uses a highly advanced 10-speed automatic transmission. A MacPherson strut front suspension combined with a compact trailing arm rear suspension keeps you confident. This setup means the minivan hugs the road through turns and any surprises. With everyone you love in one vehicle, you need to be confident the Honda Odyssey is safe. Not only does it have a solid structure designed to prevent injuries in a crash, plus airbags for all three rows of seats, advanced technologies work to avoid accidents of any kind. Reversing in a large vehicle can be intimidating, because seeing where you’re going is difficult. The standard multi-angle rearview camera removes any guesswork. Choose a normal angle, wide angle, or a top-down view to avoid obstacles and maneuver without confusion. The Honda Sensing suite bundles together multiple driver assistance technologies. It includes adaptive cruise control, lane keeping assist, collision mitigation braking, and road departure mitigation. Each one acts as an extra layer or prevention, guarding against accidents. It doesn’t take long to fall in love with the Honda Odyssey interior. With plenty of space on all three rows, even adults can comfortably sit in the back. The cargo area behind the third row is spacious as well and expanding it is a quick process. As the driver, you enjoy quite a few benefits. For example, the digital driver information interface is a 7-inch screen that keeps you in the loop with safety alerts, incoming phone call info, and more. The smart key means getting into the minivan and starting the engine doesn’t require getting the key out. Your passengers will appreciate the available moonroof, sliding rear doors, and hands-free powered tailgate. Contact Mel Rapton Honda to schedule a test drive today.